As we approach ‘Malala Day’ on 10 November, the EFA Global Monitoring Report reveals that Pakistan scores in the bottom ten of new country rankings for education of poor females. As we stand together on ‘Malala Day’, it is vital to stand up for what Malala believes in, and to put the spotlight on the extreme disadvantage that many poor girls and young women face in getting to school. Our new Education for All Global Monitoring Report and our new interactive website – World Inequality Database in Education, WIDE – provides us with a global scorecard ranking the extent of education poverty in countries around the world. Pakistan is in the bottom ten countries for the proportion of poorest girls who have never even spent time in a classroom. Only six African countries are in a worse situation. It is also in the bottom ten for the amount of time that young women have spent in school in their life-time. 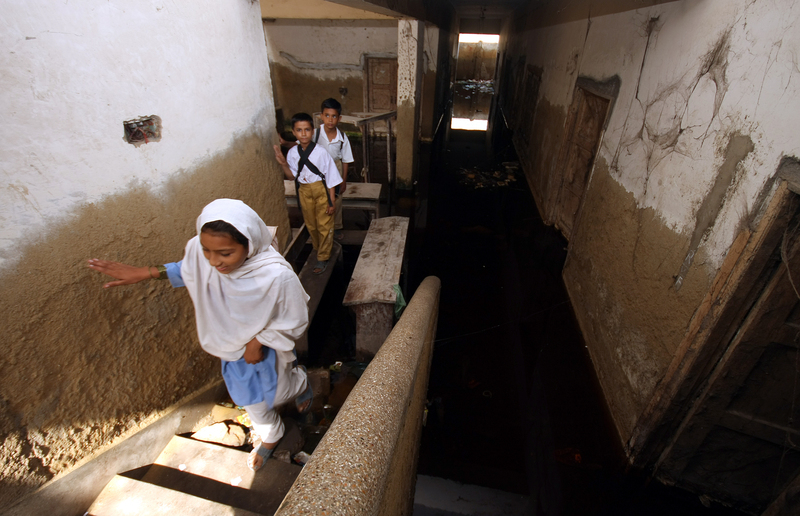 Almost two-thirds of poorest girls in Pakistan have never been to school. The long term neglect of education means that the poorest young women in the country have only spent around a year in school on average. Without a real step change by the government to give these children and young people the education and training they need, including a second chance for those who have missed out, they will be denied equal opportunities in work and life forever. This entry was posted in Basic education, Gender, Out-of-school children and tagged female education, Gender, Malala, Pakistan. Bookmark the permalink. This is an excellent example of how information should be collected and used to promote the rights of other disadvantaged minorities – especially children with disabilies who have been overlooked in EFA monitoriong, partly because no data have been collected. I think data collection is very important to exposing the inequality of young and poor women with respect to gaining equal access to education. Obviously the government is not doing anything to change things to help women. My question is what should be done to put pressure on this government to allow women equal access to education so they may prosper in their livelyhoods? Hmm. I suspect this isn’t as much girls/ boys as you think. Somalia:26% more boys have done 4 years. Niger: 14% more boys have done 4 years. Liberia: 21% more boys have done 4 years. There are greater disparities based on wealth and region. Mali: 17% more boys have done 4 years. There are much greater disparities based on wealth and region. Education for girls is crucial in developing countries. This report and the initiatives by 1Goal are a step in the right direction. Data speaks the truth always. One cannot find excuses for these anomalies. This is a wake call for those countries who are neglecting deliberately the female child from opening their eyes .I do not see in the list Afghanistan? Is it the lack of information / data where schools are burnt down and female children thrown acid. Many thanks for your comment. The data are indeed a wake-up call. As the intention is to include internationally-comparable data, the dataset includes countries which have Demographic and Health Survey or Multiple Indicator Cluster Survey data. At the time of preparing the dataset, we did not have this information on Afghanistan. However, data from Afghanistan have been released recently so we hope to include the country when we update the website. Female education is must need for our country developing. this report is very useful for o motivate female education. thanks for sharing this big list. Female education is very much necessary for developing any country. A very good article on women education.. Visit this link.. U vl get to know a lot. HRM anyone else notice how they are all 90% Islamic nations? Anyone else notice how women are oppressed and suffer the most under Islamic nations? I don’t think it’s the religious oppression because i’m a Muslim as well and i am encouraged to pursue education to the highest level in fact every women in my family are encouraged to do so. From what i see it is a cultural thing. And also Islam encourage everyone, men and women to pursue education. You’ll be surprised to hear about the amount of women included in the Islamic Golden Age. REALLY IT IS A GOOD INDICATIVE WHERE COUNTRIES ARE IN-TERMS OF GENDER EQUALITY. BUT THE DATA FOR ETHIOPIA SEEMS HIGHEST IN REALITY THE GPI WAS 0.94 FOR 2012/2013 FOR GRADES 1-8 OF AGES 7-14 AS TO THE MINISTRY OF EDUCATION ANNUAL ABSTRACT. This data can be very helpful for the particular Governments, policy makers and practitioners, so that they can divert the resources for the girl’s education and take it on their first priority. But sometimes only resources cannot solve the problem as there may be some hidden elements that restrict the girl’s education, they may be of some social, cultural and religious barriers. In some certain cases there is a need to change the mind set, which requires a lot of commitment and time. But we should remember that “ slow and steady win the race”. This data was very useful towards my school exhibition. That’s why we are up education. Based on This kind of information we should fight for education. To make all children aged from 7 to 25 get compulsory education. According to me Female education is very much necessary for developing any country. We should take a stand for it. Female education is must for growth of any country. Yes, till girls, esp Adolescent ones are not literate, that country cannot leave Poverty behind. Literacy/NFE/AE one quick alternative, till this gap is filled.